Who was Crazy Horse and why was this Native Indian chief famous? Summary: Crazy Horse (c.1849–1877) was a famous chief and war leader of the Sioux tribe. He was a leading figure in the resistance to white settlement on Sioux tribal land. Crazy Horse fought with the Indian tribe confederation that defeated General Custer at the Battle of Little Bighorn in 1876. He surrendered in 1877 and was killed whilst in custody. The following fact sheet contains interesting facts, background history and information about the life of Crazy Horse and the events in history that led to his fame as a great Native American Indian leader. Crazy Horse was one of the greatest and most ferocious leaders of the Sioux Native Americans when it came to preserving their culture. There have been no accurate reports regarding the birth of Crazy Horse – birth year and birth place. According to some reports, he was born in 1845. Others are saying that it was 1849. That is why historians settled with generalizing the decade in which speculations are the strongest, 1840. Another issue regarding the man was how he received the name Crazy Horse. Many believe that the name was passed on by his father after he showed tremendous skill as a warrior. Crazy Horse was always a stand out, not only in his skills as a warrior but also in terms of his looks and character. In fact, his looks may have been the reason why he was isolated from others of his same age. The Lakota Sioux was not in turmoil when he was born. They were the largest band of the Sioux Indians who roamed the Great Plains freely and they still had the Black Hills in their grasp. Things changed, when the United States government started their policy of westward expansion in search of new lands to settle, gold and other raw materials. Unfortunately, it was towards the direction of the Black Hills of Dakota. The first skirmish that Crazy horse witnessed was an event forever remembered in history as the Grattan Massacre. The Grattan Massacre was an incident involving the United States Army and the Lakota Sioux on August 19, 1854 in Goshen County, Wyoming. How the events turned to bitter conflict was sudden. The inexperienced and arrogant Lieutenant John Grattan, of the U.S. 6th Infantry Regiment, entered an encampment of Sioux demanding to talk with its chief, Conquering Bear, about an incident in which a Sioux Indian called High Forehead had killed a settler’s cow. Lieutenant John Grattan was heavy handed with the Sioux and Chief Conquering Bear was killed in a scuffle - he shot in the back when he did not agree to the deal that the whites offered. The furious Sioux retaliated and all of the 30 US Troops were killed. The press called the incident the 'Grattan Massacre' reporting that enraged warriors "rampaged throughout the night, swearing to attack other whites". The Grattan Massacre became the opening engagement of the First Sioux War. The series of conflicts referred to as the Sioux War were to last from 1854 to 1890. Crazy Horse was only a young man when he witnessed the events of the Grattan Massacre. He realized that there would be many other battles to fight against the white intruders. In November 1866 Crazy Horse became involved in an incident known as the 'Fetterman Fight', which was a battle during Red Cloud's War. Crazy Horse acted as a decoy leader helping to lure Lt. Colonel William J. Fetterman and 80 soldiers from Fort Phil Kearny into a trap. With 81 American fatalities, the Fetterman Massacre was the US army’s worst defeat in the West until the Battle of Little Bighorn in 1876. It spread terror amongst the white settlers. The 'Fetterman Fight' forced the American government to end Red Cloud's War. They wanted him to sign a peace treaty and their only option was to retract their troops from the forts which are located from within the region. The Fort Laramie Treaty of 1868 was made in which the army agreed to abandon the posts along the Bozeman Trail. 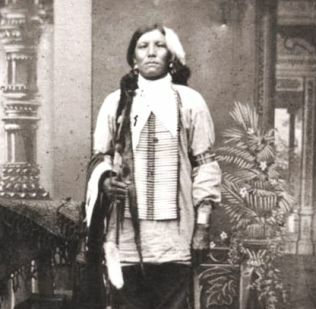 Red Cloud had won both his war and a peace settlement. Crazy Horse did not agree with the peace treaty and continued his battles with the Americans. The lands of the Sioux were again threatened by the invasion of prospectors who found out that gold was abundant in their area. Crazy Horse and another famous Sioux war chief, Sitting Bull, stood together to fight the invaders. Crazy Horse helped to develop the powerful Sioux-Cheyenne alliance that resisted the U.S. reservation policy. On June 17, 1876 Crazy Horse won the Battle of the Rosebud in Montana. A joint force of Lakota Sioux and Cheyenne under Crazy Horse turned back soldiers commanded by General George Crook cutting off reinforcements intended to aid General Custer at the Little Bighorn. Crazy Horse then went to join the forces of Sitting Bull. On 26 June 1876 the Battle of the Little Bighorn took place. The combined force of Native American Indians rode to attack General George Custer killing all of his 231 men including Custer, his two brothers, his brother-in-law, and his nephew. The Battle of Little Bighorn became known as the greatest victory of the Native Americans against the U.S. soldiers. The stunned and angry reaction to the US defeat at the Battle of Little Bighorn prompted a massive outcry and the US government flooded the area with troops, forcing the Native American Indians to surrender or flee. Crazy Horse continued fighting to a point that some of his warriors were starting to leave him. He was no match against the overwhelming US opponent which forced him to surrender. Crazy Horse surrendered on May 6, 1877 and spent the summer near Fort Robinson, Nebraska, awaiting assignment of a reservation for his people. For additional facts and information refer to the legend and the Story of Crazy Horse.